I am using Ubuntu Linux. How to force Linux to reacquire a new IP address from the DHCP server? What is the command of Linux equivalent to Windows’s “ipconfig /renew” command? You need to use Dynamic Host Configuration Protocol Client i.e., dhclient command. The client normally doesn’t release the current lease as it is not required by the DHCP protocol. Some cable ISPs require their clients to notify the server if they wish to release an assigned IP address. The dhclient command, provides a means for configuring one or more network interfaces using the Dynamic Host Configuration Protocol, BOOTP protocol, or if these protocols fail, by statically assigning an address. How can I renew or release an IP in Linux for eth0? The -v option shows information on screen about dhcp server and obtained lease. Resolution provided was short but very effective. Helped me to resolve the issue. This worked great, I was having a bit of problems thought worked them out in the end, thought I would share. I unplugged the network cable, then plugged back in a couple minutes later. Couldn’t access network, tried dhclient -r command and didn’t work. Found that dhcpcd was still running, so done a killall -9 dhcpcd then executed dhclient…worked! It seems that network manager runs it own copy of dhclient. Works for me on Ubuntu 9.04. It seems to me, that the network-manager does not notice the change. After sudo dhclient -r the command ifconfig eth0 shows no ip address at the interface. After sudo dhclient the command ifconfig eth0 shows an ip address again. Sure it has, depending on your dhcp server configuration. You can define how long one IP will be served to the same MAC address. Since you did not “change” your MAC address, the dhcp server might give you the same ip. How t o Assign IP Address For DHCP Client Linux.. Thank you for the recommendation, it works good. Thank for your solution, really help me. Well, it releases them, but when I renew it, it gives me the same ip back. I wanted a new IP. Is there way to force a NEW one? You need to tell the dhcp server to issue a different one, typically I dhcp server will if it can issue the same address. You may be able to tell it to forget what it last issued, or you can usually make a mapping between the mac address of your nic and the ip you want, but generally unless you do something on the server it wil reissue the same address. Usually a DHCP server maintains a list of the leases by assigned IP and the MAC (unique identifier) of the device who has the lease. If you don’t have access to the DHCP server in question, then the simplest way to get a new IP would be to change your device’s MAC somehow, as a DHCP server will usually give you your IP back since its still leased to you. If you have access to the server than you can simply delete the entry, however, if its the first IP unassiged on the list, you’ll get it again unless another device takes it or if you exlude the IP address. If you’re having problems getting your Linux distro to get a new IP the easiest thing to do is to just reboot your router (assuming you can do that). If that doesn’t work you can add the old address as a statically assigned DHCP address to a bogus MAC address. 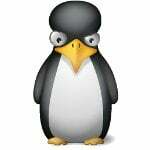 This will lock the Linux box out of it’s old address and force it to get the new address. 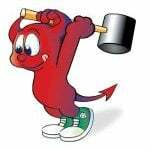 This kill the running dhcp daemon which is noticed by Network Manager which then immediately downs the interface, so the dhclient can not send the DHCPRELEASE packet. The solution is to disable NM (right clik on its icon and uncheck the first option “Enable Netwroking” – this is so on Ubuntu 10.10, other version might look a bit different), kill existing dhclient processes, then establish the connection manually, run dhclient eth0 , then run the above dhclient command to release the IP. Fantastic! Worked like a charm on Ubuntu 10.10! Thanx! Hey, is there anyway to do this command at system start? I have Ubuntu 12.04 and dhclient did not work. I simply used ‘sudo ifconfig eth0 down’ then ‘sudo ifconfig eth0 up’. Worked for me. It should be noted that the methods discussed in this post may enable one to get a new IP address lease for one’s computer or workstation, but if the computer is connected to a wide-area network (WAN) through a DSL modem or cable modem with its own built-in DHCP server, this will not necessarily result in a new IP address as seen by the outside world. Unless one has a way to remotely take control of the modem and cause it to issue a request to the Internet service provider’s DHCP server for a new IP address, one will still have the same address until the IP lease expires or until one physically disconnects the modem from the WAN, waits a while, then reconnects in the hope that the ISP’s DHCP sees it as a “new” connection. does NOT renew the IP-Address! You must specify the interface! 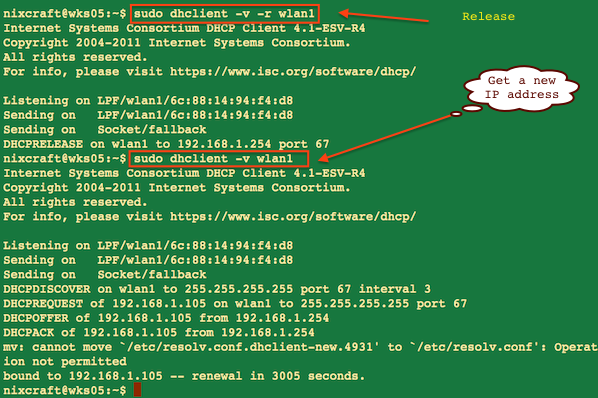 It is not necessary to run “sudo dhclient -r” in advance. 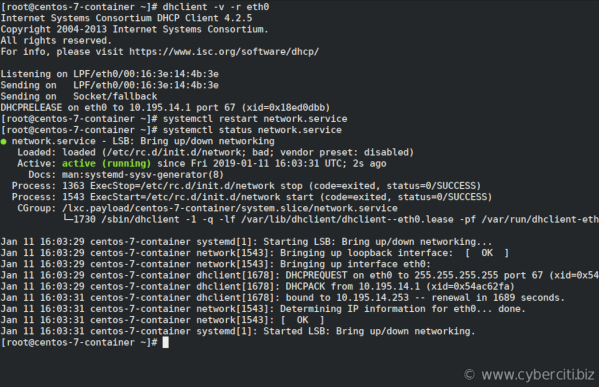 If you are using an SSH-connection and run “sudo dhclient -r”, you will lose the connection to your server and you will not be able to reconnect. @NIXCRAFT: please add this information to your post! I have a habit of resetting my router before I go to sleep. Occasionally this means that I reset while the VPN is on, then turn off my computer. The result is that the connection no longer works without the VPN. In the past, I’ve fixed it by fiddling around with restarting my computer, resetting my router, and variations of that with the VPN on, or off, or on for part of the process, etc. This is a much easier way to fix it.